​Perth Modelling Agencies – How to get modelling jobs in Perth without them. If you’re interested in getting started in modelling or are searching for Perth modelling jobs, here is a guide to modelling in Perth which may help you get started quickly, saving you time and money. Extra money is always welcome right? A lot of models get started because they want additional income to supplement their lifestyle. Eg. Save for a holiday, pay off the car loan, save up for deposit on a house. Modelling in Perth is a popular part time activity with students and full time wage earners because of it’s high rate of pay per hour and flexible schedule. This means models can schedule their modelling jobs when they are not at work or school so it doesn’t interrupt their day. The high rate of pay enables models to earn more in a couple of hours of modelling compared to a full day at work. More reward for less time spent is always a good thing. Money isn’t everything. The excitement of being part of a creative modelling assignment and seeing your contribution come to life can be very rewarding. When followed by all the social media Likes on Facebook and Instagram, it can certainly become addictive. Looking further down the track in 10 years or more, you’ll probably be glad you did something cool while you were younger. Money will always come and go, however you only have your youth now, and it’s as good a time as ever to record and capture it. Perth Models who have started modelling have found it has helped them in other career paths such as Acting, Marketing and Promotions, Sales, Makeup Artistry, Hair Styling, Beauty Therapy, Photography, Social Media management, Public relations, Fitness & Wellness. To excel in Modelling or any other creative endeavour it needs to come from the heart. You need to be passionate about it, rather than just doing it because someone told you to. However if a family or friend has suggested you give modelling a go, perhaps consider it and find out if it’s for you. ​With so many beneficial reasons to get started in modelling it’s no surprise that the Perth modelling industry is quite competitive, especially for well paid modelling jobs. Thankfully there is an increasing number of modelling job opportunities in Perth now, thanks to changes in consumer demand, new social media platforms and Government policies for increased diversity in advertising. Perth Modelling Jobs : Where are the Opportunities? Previously only large companies could afford big budget advertising campaigns on TV, glossy magazines, and newspaper advertisements. When these expensive campaigns are broadcast to a wide audience it is critical the best models are chosen that appeals to the largest number of people in the target market. In today’s world, for every one large company there are tens of thousands of small and medium sized businesses who can afford to advertise on social media. TV ads have given way to YouTube, glossy magazines have been replaced by websites and newspaper ads have been replaced by the newsfeed on Facebook or Instagram. With the cost of advertising on social media a fraction of the cost of traditional ads, and over a ten times more effective, more and more businesses are now searching for models and social media influencers to get their brand message out there. Consumers have also become more savvy. Gone are the days of an attractive model holding up a product they don’t know anything about or haven’t used themselves. Consumers want the real deal, preferring to follow real life role-models they can relate to, who have genuinely experienced products or services and are speaking passionately about them. Authenticity is now key. Consumers have also shifted their focus towards niche services and products. Instead of trying to find the “perfect face” to attract a wider audience, the trend now is to find multiple models / characters who can relate to a segmented audience. This means more opportunities for a wider range of models. ​Local Perth business Zubias Threading used to only have a single model face a 5 years ago. In recent years they have shifted to having multiple faces for their business (2 females & 1 male) and are now searching for more social media influencers as brand ambassadors. This is a good example how the number of model opportunities in Perth has grown, from 1 model to 3+ models each year, just from one business alone. Perth Modelling Jobs : How to get them? ​Although there is still a role for a few Perth Modelling agencies who specialise in catwalk and high fashion, much of the modelling opportunities in Perth is freelance modelling work. Gone are the days of relying on a modelling agency to find you work. Using today’s social media platforms, a world of opportunity is accessible with just a few clicks of the button. Before the internet, if a client wanted a model for a creative project they would have to contact a modelling agency, arrange an appointment at their office and physically browse through their books, which contained comp cards of each model. The modelling agency would then check the availability of the model, negotiate and handle all the administrative matters. This whole process would usually take days or a few hours at best. With today’s high speed internet a client can search numerous freelance model portfolio sites or make requests on community facebook groups and establish direct contact with models immediately, within minutes! This eliminates the need for multiple handling of communications, hence no need for any modelling agency to be involved. This is ideal for small to medium sized businesses who are operating on smaller budgets and have time to search for models. You are the boss in your own business. You control your own destiny, you schedule the times you want to work and the income you want to earn. 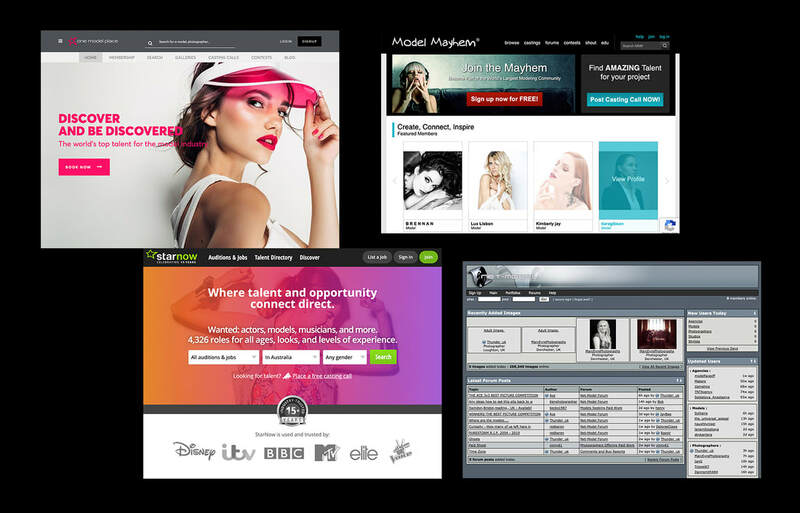 You don’t have to rely on a middleman or modelling agency to bring you work. No need to pay commissions to a modelling agency. You get to keep more money and your client will save money too. You’re free to accept any jobs you want, provided it doesn’t conflict with any prior agreements you’ve had. Eg. If you have modelled for a major Brand, you will usually have to agree that you won’t model for a competing Brand in the same industry for a certain amount of time or until your contract expires. ​The Perth Modelling industry is relatively small compared to the likes of Sydney, Melbourne, London, Milan, New York. However this doesn’t mean there is little work. In fact, with more Perth businesses using social media, there is an increasing demand for fresh faces to be brand ambassadors. The first step to securing modelling assignments is to be found. It’s as simple as creating an account on one of the many model portfolio platforms, and uploading your photos to show what you look like. Potential clients are then able to find you on their searches and contact you if you’re suitable for their modelling assignment. Most of the model portfolio sites offer free trial accounts, so it doesn’t hurt to be featured on a few of these platforms. Have a clean well lit headshot as your feature thumbnail. No dark shadows on your face, no distracting backgrounds. You may have the most amazing model portfolio photos, however no one is going to see them if they aren’t attracted to click on your feature thumbnail first. Ensure your model portfolio showcases your diversity. Closeups, 3/4 Shot, Full length, with various expressions. The more sides to your personality you can show the better. Less is More! Quality over Quantity. It’s better to have 5 high impact images than to have 50 medicore ones. Ensure your personality and passion for modelling is conveyed in your blurb / description of yourself. However, keep it short and succinct. ​Before you start browsing your mobile phone for your best selfies to upload, just consider the quality of mobile phone photos. Will they serve you and present you in the best light? Do your photos look professional? Are your photos comparable to what we would expect in a commercial advertisement, fashion magazine or billboard? This is where we recommend models get a headstart by having a professional modelling portfolio organised. If businesses invest good money on having their products photographed beautifully to be promoted online, shouldn’t you consider having yourself photographed professionally as well? Prepare and pack your wardrobe the night before ensure you’ve got all your wardrobe and accessories sorted. Choose your wardrobe well, and relate it to the characters or roles your intend to play. Keep distracting patterns to a minimum, the attention should be on you, not the clothes. Hydrating with at least 2 glasses of water the night before when you sleep, and 2 glasses immediately when you wake up. This will ensure your skin is fresh and toned, ensuring you glow in front of the camera. Aim for 6hrs, 7.5hrs or 9hrs sleep, as this will synchronise with natural sleep cycles and help you wake up full of energy. Have a light meal at least a couple of hours before your shoot. This will ensure you’re comfortably full, while having steady energy levels to perform at your best. Have your hair and makeup professionally done. Not only is this one less thing to worry about, but the way makeup is applied for photography is very different to how you would wear makeup on a daily basis. Makeup for photography is applied with more contrast, the eyeshadow and blush tones are stronger because the dynamic range of the camera is less than what the human eyes can see. In simple terms, if you don’t apply makeup strong enough, your key features will lack definition in the camera. Where to have your Model Portfolio Photographed? ​There is a wide variety of Perth photographers available on the internet and on various community forums with an equally wide range of budget costs, ranging from inexperienced beginners, amateur hobby photographers to semi professionals and professionals. On one hand choosing a cheaper photographer is tempting, however if your modelling portfolio doesn’t show you at your absolute best, you may not attract any work. On the other hand, choosing an experienced photographer who helps you bring out your best may help you secure modelling jobs, enabling you to get a return on your initial investment and then continue to profit as your modelling portfolio works for you online 24/7. Experienced shooting fashion models for magazines and advertisements, and of course model portfolios. Creative Makeup and Hair team, ensuring you look your absolute best! 100% Satisfaction Guaranteed. If you don’t believe you look your best, you don’t pay a cent. Be careful of any “Model Agencies” who ask for significantly high joining fees. Sometimes admin fees are valid, however it should generally be under $100. Be cautious of any “Model Agencies” who insist you purchase another model portfolio shoot with them, even though you already have a professional model portfolio. Exception : It’s quite acceptable to add additional photos to your portfolio if you don’t have that particular character or look, or if your appearance has changed significantly and you need to update your portfolio. Ask the “Model Agency” if they have an agency license from the Department of Mines, Industry Regulation and Safety. The Employment Agents Act 1976 (Act) requires a person carrying on the business of an employment agent to obtain a licence. Section 5 of the Act provides that an employment agent is a person who obtains work for persons seeking to be employed or who acts for employers to find employees. A person can be an employment agent whether or not this work is all, or part, of what they do for a living. If you’re attending any casting calls, interviews, or photo sessions, we recommend going with a chaperone, especially if it’s the first meeting and if it’s in a questionable location like a private home or secluded public space. When approached in real life or online by any talent scouts, model agents, photographers, ask for their website and social media presence. Does the quality of their work look professional? Are there positive reviews? Which well known brands or clients have they worked with? ​We hope this Guide has been useful to help get you started modelling in Perth.